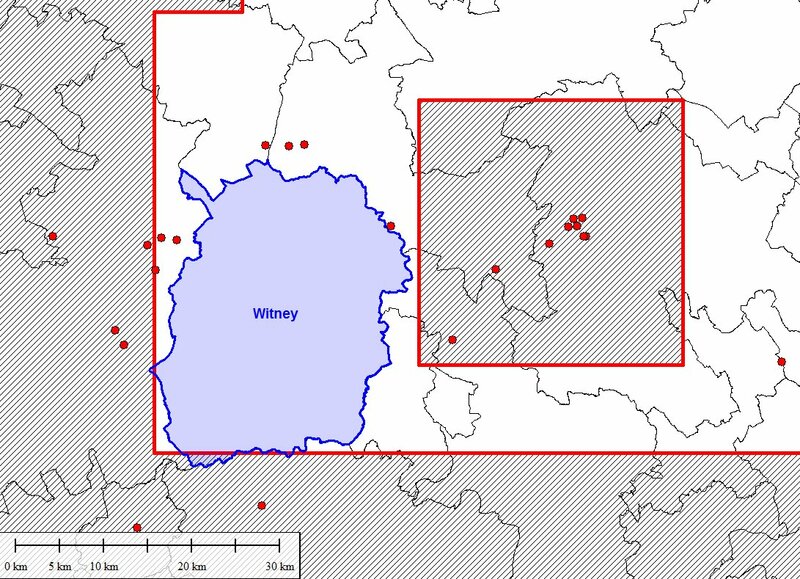 Has David Cameron instructed DECC to omit his Witney constituency from the areas currently under offer in the 14th round of onshore licensing? Below is a map of his constituency shown in blue, with adjacent constituencies outlined in black. The red boundaries with the hatched areas mark the 14th round offer acreage on offer. The acreage is made up of 10 km x 10 km blocks, based on the Ordnance Survey grid. The ‘island’ square to the east of Witney comprises nine such blocks. Existing onshore oil and gas exploration wells are shown by the red dots. DECC will be announcing the licence awards within the next couple of months. As you probably know, DECC’s 14th onshore round of licensing is designed to open up for exploration all the areas which have even the slightest potential for shale gas or oil. Basically this means the whole of the UK, except for the mountainous and upland areas where there is crystalline rock at the surface, and no prospect whatsoever for shale fracking. So the Highlands and Southern Uplands of Scotland are omitted, together with the Lake District, most of Wales, and Cornwall. 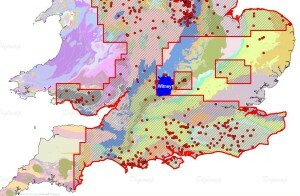 The regional map below shows the geology of Wales and southern England in a variety of colours, with the 14th round offer areas and existing wells on top. Witney is in solid blue. Inexplicably, DECC has omitted from the offer a big swathe of eastern England, extending from David Cameron’s Witney constituency eastwards to the coast of East Anglia. I say ‘inexplicably’, because there is nothing about the geology of this region that particularly warrants its exclusion. DECC normally takes a pragmatic approach to licensing, and one of the guides to licensing new areas is to take into account whether there has been past interest by the oil industry. Evidence for this is best shown by the drilling history. For example, around Witney there are a score or more of old oil exploration wells within a distance of 10-20 km. Within the east of England ‘exclusion zone’ there are two islands of blocks on offer, and although the historical well density is fairly low there has clearly been past oil industry interest in the region. The Witney constituency itself is densely covered by seismic profiles – another indicator of exploration interest – and the area was licensed for oil exploration in awards made in 1971 and 1981. In addition, one of the seven UK regional seismic profiles compiled on behalf of DECC by the UK Onshore Geophysical Library runs right through Witney town. The surface geology is shown in colour on the map above, and although this picture is not necessarily a reliable guide to the geology at depths of more than a kilometre or so, we do know that the upper layers of rocks in the south-east are of Mesozoic and Tertiary age, and that these contain several important shale and clay layers, possibly suitable for fracking. The Witney constituency is no exception. “… the areas included for offer in the 14th Onshore Round were primarily determined by the underlying geology indicating to DECC that hydrocarbons could be present in those regions. Although this explanation might possibly account for the inclusion of the more westerly of the two island blocks within the exclusion zone, it fails to explain adequately why the Witney area (a 30 km by 40 km set of twelve blocks) has been excluded. If the island of blocks referred to by DECC and included in the offer really is the subject of “active interest” then a more rational 14th round offer map, based on exploration potential, together with expressions of interest, would have been to place the western boundary of the exclusion zone to the east of this block, in the Bletchley-Aylesbury area. So non-geological reasons must have played a part in the specific exclusion of Witney from the 14th round offer. DECC should be required to explain its choice of blocks in this area. Was there an expression of disinterest, and if so, from whom? The constituents of north Yorkshire and north Nottinghamshire, currently under threat of planning applications to frack, must be wishing that they had such an influential MP as David Cameron. I thank Christopher Tedd and Sandie Moore for drawing my attention to the Witney mystery. What do we know about the Newdigate, Surrey earthquakes? I am David Smythe, Emeritus Professor of Geophysics in the University of Glasgow. I retired from the university in 1998 and live in France, where I continue my earth science research. This blog aims to correct some of the errors, omissions and misleading propaganda published by expert scientists in support of fracking. It complements my web page davidsmythe.org/fracking, where more detailed documents may be found.